Who should be HAZWOPER trained? 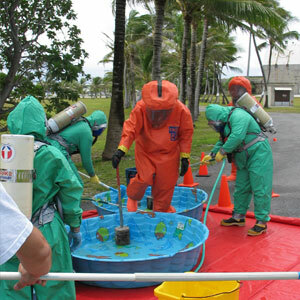 According to the OSHA standard 1910.120(e)(1)(i), employees exposed to hazardous substances, health hazards, or safety hazards and their supervisors and management should be trained in HAZWOPER before engaging in hazardous waste operations that could expose them to hazardous substances, safety, or health hazards. Workers engaged in hazardous substance removal or other activities which expose or potentially expose them to hazardous substances and health hazards must receive a 40 hour (5 day) course before engaging in hazardous waste operation or emergency activities. Workers who are occasional for specific, or limited tasks and who are unlikely to be exposed or who work in areas that are monitored should have the minimum 24-hour (3-day) class before engaging in hazardous waste operation or emergency activities. Supervisors, and managers may also take an annual re-certification course which is an 8 hour (1 day) class.